I first encountered and really grasped the consequences of scope parallax error some years ago while tuning a PP700W air pistol over a number of weeks. The pistol was intended for HFT competition use and was fitted with a fixed focus 4x25 scope. I’d corrected a series of mechanical problems with the pistol and had refined the regulation so that there was much less discrepancy shot to shot. However, at the range, no matter how securely I rested the pistol on the bench rest, the .22 pellets often missed their mark, seemingly randomly by around 5mm on a zero target set at 15 yards. I’d seen the error in the past and being quite honest had always put it down to either my inability to shoot straight, or a muzzle energy differential in the gun, but this time the chronoscope tended to contradict the muzzle energy differential as the cause. On one particular night I noticed something really odd as I happened to reach for a mug of coffee. With the unloaded and un-cocked pistol propped securely on a bench rest cushion and with a sharply focused reticle set dead centre on a 15 yard “zero” target, I moved my head to one side and noticed that the crosshair came off the target. After a double take I suddenly realised, that unless my head was in precisely the right place when viewing the target through the scope, the crosshair simply wouldn’t sit on the target centre and so it wasn’t possible to accurately zero the gun. I mentioned this to a good range friend (Alan) who suggested it might be a parallax error – something I’d heard of but didn’t fully understand. I suspect that might also apply to quite a few air gunners and so I wrote these notes. The problem was that the pistol had been fitted with a fixed focus 4x25 scope and unfortunately fixed focus scopes always come with a guarantee of parallax error. Parallax error is easy to demonstrate using your thumbs as shown in this picture. Align both thumbs with your dominant eye and then move your head gently to the left and note how the thumb closest to your eye appears to move right. This occurs because the two thumbs are not in the same focal plane. If you were to bring your two thumbs together (placing them in the same focal plane and side by side) then the same error won’t occur. Don’t confuse this with the focus of the reticle (crosshair) which is a separate issue. Generally all scopes (even cheapy ones from fleaBay) have a front focus ring designed solely to bring the reticle into sharp focus. You typically point the scope at some bland but well lit object (for example the sky or a blank white wall) and then turn the dedicated reticle focus control to make the crosshair reticle pin sharp. By doing this, you place the image of the reticle into a focal plane that makes it pin sharp for your particular eye. For this discussion, let’s assume that that reticle focus is sharp when you view through the scope. What about focussing the target image... well, unfortunately for fixed focus scopes there isn’t a separate focus control for the target image. Fixed focus scopes are manufactured so that at a single fixed distance (quoted by the manufacturer as the parallax range) a target will be sharply in focus. For example quite a few 4x32 fixed focus scopes quote a parallax range of 100 yards in their specifications and that figure means that if the scope is used to view a target at precisely 100 yards, the focus of that target will be pin sharp in the scope. As the 100 yard target is then correctly focussed and as we know the reticle (crosshair) adjustment has been made to ensure the reticle is sharply focussed then the two images will be in the same focal plane when viewed by the shooter. Any head movement under those circumstances won’t matter, because the crosshair and the target will remain perfectly together. It’s a little like having our two thumbs side by side in the example above. But what happens when the target is at some other distance than that single parallax range? Well, because the target image won't be in the same focal plane as the reticle then it will either end up in front or behind the reticule image. As the target image and the reticle image are not in the same plane (just like a thumb that’s close to the eye and one that’s more distant in our example) the viewer will see a shift between the reticle image and the target image if they happen to move their head. Unless the shooters eye is precisely centre aligned with the scopes optical axis, this error is guaranteed to occur when the target isn’t sitting at the parallax range. The maximum parallax error lies between 6 and 12mm at the target unless the shooters eye is positioned precisely on the centre line of the optical axis of the scope and interestingly that error is considerably worse when the target is closer. The calculated errors closely correlated to the error I experienced on the shooting range at 15 yards. The only way to accurately resolve the problem is either to use open sights or to use a scope with an adjustable focus for the target image - sometimes referred to as an AO or Adjustable Objective scope or a side wheel focus scope (they both do the same thing, but use a different technique to achieve the effect). This is where the focus is designed to bring the target and the crosshair into the same optical plane eliminating parallax error. There are four ways to achieve parallax correction in a scope. This is usually a numbered ring that sits in front of the eyepiece and which is marked in yards from a minimum to infinity. Generally these are only found on fixed power scopes due to their internal construction – normally when the fixed magnification sits between 8x and 20x. 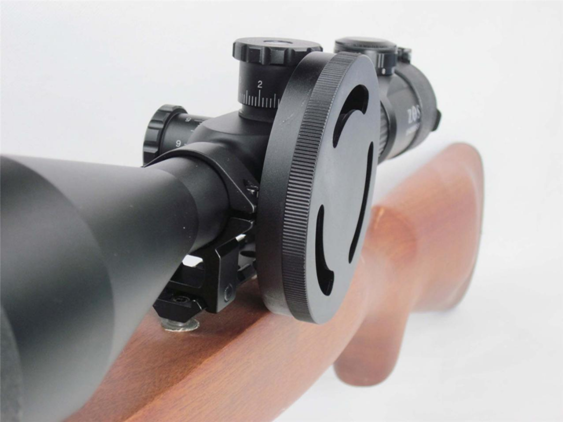 The adjustment will be near the shooters eye so it can be reached and as a design it is cheap to make, but in practice it is a coarse adjustment and impossible to make work with variable magnification scopes. This design will be familiar to air gunners as the traditional side focus or "wheel" scope. The focus turret is usually on the left side of the bridge of the scope and comes with yardage increments on the wheel. There are two big advantages with this design – firstly the wheel allows the shooter to accurately set the focus so that the parallax error is minimized. Secondly if the wheel is calibrated, it allows the shooter to range check the target. Accurately being able to tell the target range allows a shooter to determine the hold over or under required to bring the pellet onto the target, based on the known ballistics curve of the pellet. Side focus provides two levels of accuracy and it is also possible to alter the focus while the shooter is in firing position. The disadvantages are that it is more expensive to manufacture because it is more complex (requiring an additional centre lens arrangement) and off course more can go wrong. The oldest and most proven solution to this problem and arguably still the best way to resolve it is simply to adjust the focus by means of an adjustable objective bell lens, where the bell is usually marked in yards and the thread offset is used to physically move the lens. 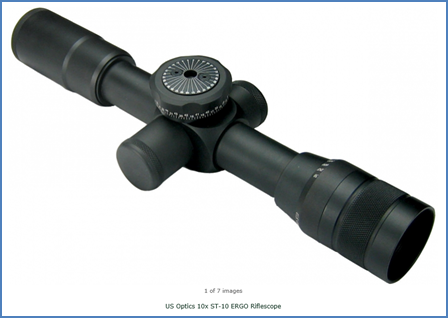 These are often referred to as adjustable objective or AO scopes. It is by far the cheapest solution to make and the most versatile as it suits any magnification and any lens diameter. It is also mechanically the most robust. The downside is that it’s hard for the shooter to reach or alter when in firing position and it does introduce a risk of water ingress. The Hawke IR scope (shown below) is a particularly good and reliable example of an AO scope. The first is to lock the position of your head and eye by using something like an eye piece. In that way you help lock your eye position in a reproducible way for every shot. 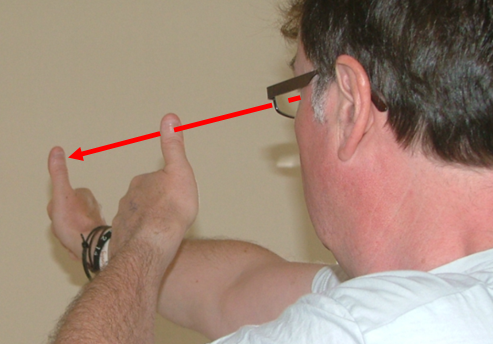 A second technique is to take advantage of a narrowed eye relief, where the position of the eye results in the scope cylinder obscuring some of the target view. You can do this by bringing your eye slightly too close to the scope until you can see a dark ring obscuring the outer part of the target view. You then position your eye so that the dark ring is evenly spaced all the way round the boundary of the scope tube – and in that way you go some way to minimising the parallax error leaving your eye on the centre of the optical axis. The problem with both techniques is that they are highly subjective and really very difficult to make work in practice across multiple shots. The best way to resolve parallax errors is simply to use open sights or a scope with an adjustable target focus. Once the focus is properly set the parallax error will be almost entirely eliminated. With the target and reticle pin sharp, head movement won’t result in any movement between the crosshair and target. With the eye relief set, focus the reticle with your eye at that distance. Aim the scope at a constant flat colour with fairly good lighting – but without any high contrast change. For example a white wall or the sky works well. View the ocular lens from the eye relief distance and then turn the reticle focus control so that the reticle is pin sharp. Test the setting by moving your eye away and then back onto the ocular lens to make sure your eye is not compensating unduly. The reticle should be sharp as soon as it comes into your field of view. Lock off the adjustment if possible. Point the scope at a zero target, and adjust the focus until the zero target is sharp. You can test that the focus is correct by gently moving your head left/right to make sure the reticle and the zero target remain aligned. At that point you have eliminated parallax error. Zero the scope on the zero target by adjusting the windage and elevation turrets to bring pellets on the target centre. It’s always a good idea to test your zero using multiple shots rather than single shots. Use 3 to 5 before adjusting so that you get an average view and rule out those odd shots that tend to spring randomly. Unless you’re very lucky, it is not that common to get pellet on pellet groupings. Regarding a suitable zero range... well, being honest there simply is no right answer to this common question. Software like Chairgun Pro allows you to model different zero distances - and takes into account the muzzle energy of the air rifle, the resulting speed (and calibre) of the pellet and its balistic characteristics. Better still the software provides a means to figure out what zero range will provide the longest distance where the centre of the crosshair can be used with no extra hold to strike a target. Personally I find that a .177 UK air rifle will zero nicely at around 30 yards resulting in a useful range between 10 and 50 yards. The slower .22 zero's quite well at around 25 yards. Mind you, that just suits me... and everyone is different. I'd been using a CO2 powered air pistol (Crosman 2240) for sports competition use - but found early on that even small changes in ambient temperature would affect the speed of the pellet... making accurate aiming rather challenging, to say the least. As it happens CO2 is one of the most efficient means of driving a pellet (far more so than compressed air). When CO2 enters a barrel (behind a pellet) it changes from liquid form into a gas which causes it to rapidly expand and drive the pellet out of the barrel. The conversion process is however heavily dependent on the temperature... being most rapid when warm, but slowing considerably when cool. Pre-charged pneumatic (PCP) air pistols don't suffer from this problem because they use compressed air to drive the pellet instead of CO2. 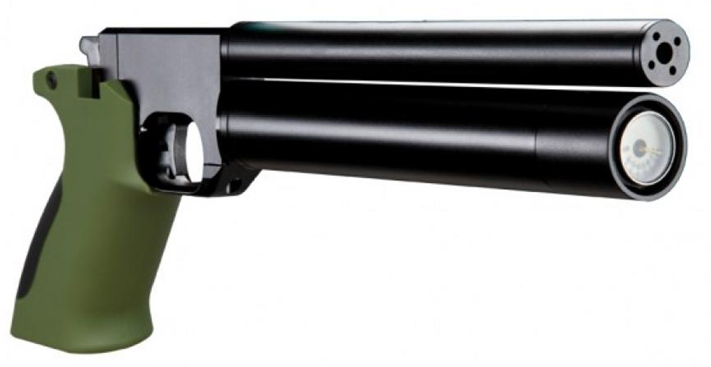 The SMK Model PP700W is a pre charged pneumatic (PCP) air pistol originally sold by SMK either in .22 or .177 calibre and which came with a characteristic and rather "loud" green grip. Newer models appeared a couple of years ago branded as Artemis with the model number PP700S-A. These had a black grip and a squared off barrel shroud with dovetail, but the organisation of the internals was the same. Both models are single shot, employing a novel rotating breech design and pull back hammer. They are inexpensive, accurate, have a good balance and can be used either in a cradle or arms-length style of shooting. They are ideal for competitive sports shooting on a budget, out to around 25 yards - and are great fun to use. The PP700W is built with a high pressure reservoir capable of holding a maximum of 220 BAR (3191 PSI). It comes with a mechanical regulator designed to control the precise amount of low pressure air that will be released to drive the pellet whenever the trigger is pulled. The precision of this control is very important if the gun is to be accurate and once the regulator has reached its goal pressure, then any further pressure change should effectively cease. Well, that's the theory anyway... Any new air gun should be carefully checked in a controlled environment to assess pellet speed and in particular the consistency of speed over many hundreds of test shots. Fired in a safe location into a steel trap these shots are also passed through a chronoscope to measure pellet speed - the objective being to ensure that all shots fall within legal limits but also to quantify the variability across multiple shots. A huge number of factors affect accuracy when it comes to air guns (this is one reason why the sport is so interesting)... but a regulators ability to precisely control the speed at which a pellet is driven out of the barrel is a very big factor. When a target is 50 yards away, a variance of ten feet per second for a typical .177 pellet results in a movement to the point of impact (POI) of around 3mm whereas a difference of 50 feet per second results in 11mm movement (close to 1/2 an inch). Generally speaking the closer the speed of each shot can be to its neighbour, the better will be the result but allowing for the fact that regulators are mechanical devices, a variance of around 10 feet per second is perfectly usable. Initial tests with the PP700W out of the box, were disappointingly awful. Shot deviation was very large (around 75 FPS) and worse if the interval between shots was altered, the variability between shots increased. If the pistol was left overnight, a tell-tale symptom was that the first shot taken the following morning would be as much as 75 FPS lower than before. This particular symptom is highly characteristic of a leaky regulator... where high pressure air on one side of the regulator is slowly over time leaking across the air valve, building pressure in the low pressure side beyond the intended pressure. When that occurs, the pressure behind the firing valve (and which is holding it closed) increases and because the energy driving the hammer to open the valve during firing remains a constant, the final pellet speed will consequently decrease the next time a shot is measured. It is a very common problem with regulators and is sometimes referred to as regulator creep. After a strip down and a significant number of tests, the deficiencies of the manufacturers regulator really became obvious. The design is straightforward - using a brass piston opposed by a conventional Belleville washer stack (left side of picture) and which opens or closes a valve made from a narrow tapered screw and a delrin washer (see the right side of picture). The piston is arranged so that it has atmospheric pressure on one side of the crown and the regulated output (low) pressure on the other side of the crown. With the pistol empty, the belleville washers relax, the piston rises in its bore and opens the connected air valve. After the reservoir is filled, high pressure air flows through the open valve to fill the low pressure chamber. Given the piston has atmospheric pressure on side, then as the pressure builds in the low pressure chamber, the piston experiences a pressure differential and so starts to compress, while being opposed by the domed belleville washers. When enough pressure differential is present, the opposition from the belleville washers will be overcome and the piston will start to move down in its bore flattening the belleville washers as it does and consequently closing the air valve. This movement occurs quite quickly, in the order of hundreds of milliseconds. A subtle weakness with any belleville stack regulator can be seen in the final end state when the valve should be fully closed, at which point the regulator should be balanced with pressure on one side of the piston generating sufficient down force to counter the opposing belleville washer force... enough to fully close the air valve. However, in practice the fact that the two forces are quite closely matched leaves the air valve precariously balanced and provides scope for some level of valve movement, especially over time. This is what causes regulator creep. A good design for both the piston and air valve will go a long way to reducing or even eliminating creep and some manufacturers (such as the very skilled Robert Lane) go further by using coil springs instead of belleville washers to reduce creep and to improve regulator responsiveness. A downside with coil spring designs is that the valve body will generally by longer compared to a similar Belleville washer design, but a spring also has a smoother, faster and more consistent reaction movement characteristic. The problem with the Artemis design is that the air valve is horribly leaky - no matter how much fettling is done to try to improve matters. If you wait long enough the pressure on both sides of the air valve eventually equalises. In some ways it behaves more like a controlled leak... which was a huge disappointment to me because in all other regards the PP700 is a really exceptional little air pistol for sports and competitive use. The problem for a sports shooter with this arrangement is that the regulator behaves differently depending on the time interval between shots. If that interval is the same every time then the regulator will generate almost identical pellet speeds each time a shot is taken. However, (and back in the real world) if the interval between shots varies then the pellet flight speed will vary horribly and with consequential poor grouping. Tests confirmed that a visible difference to the point of impact at even 15 yards would occur if the interval between shots varried by as little as 20 seconds. 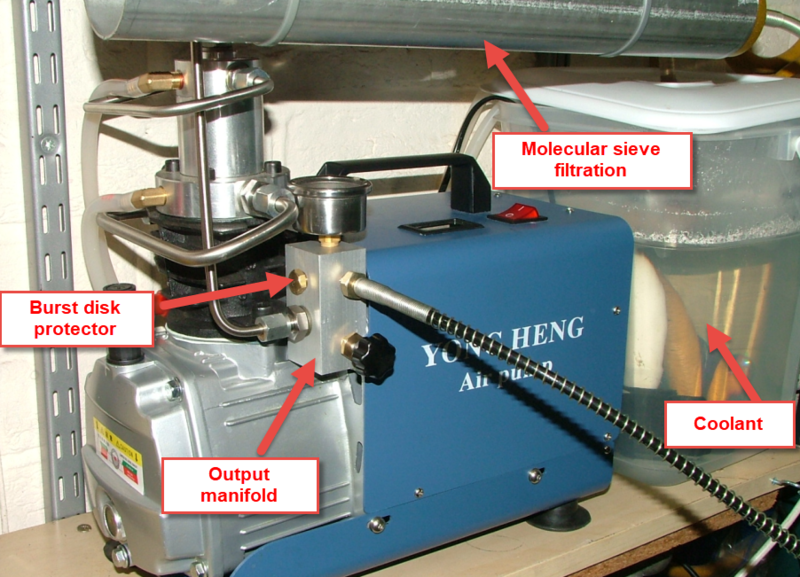 It isn't easy to improve this, but one workable method for using the PP700W for competitive use is to disable the controlled leak regulator valve altogether and instead use the pistol between two bounds of pressure (for my particular arrangement 130 BAR down to 90 BAR). So long as the diameter of the transfer port in the rotating breech is reduced, the result is around 20 accurate shots and where at the absolute peak (around 110 BAR) the muzzle energy can be set just below the UK permitted limit. This arrangement works well and is very safe... because even if the pressure drops below 90 BAR or is higher than 130 BAR, the muzzle energy will remain much lower than the legal limit. The only real disadvantage is that after only 20 shots you are forced to refill with exactly 130 BAR of high pressure air. 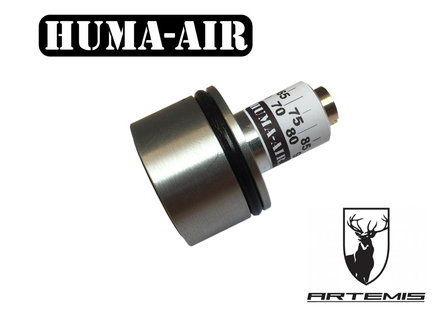 Around 3 years ago Huma-Air released an aftermarket regulator for the PP700W - based on precisely the same type of Belleville stack arrangement as SMK or Artemis... but this time employing a properly engineered and effective air valve. The Huma-Air designed regulator fits inside the main high pressure reservoir and so does reduce the overal reservoir volume, but on the other hand... it works. I fitted one in my .177 calibre PP700W a few weeks ago and now instead of just 20 shots and the irritation of having to constantly refill the main reservoir to 130 BAR, I can fill the main reservoir to 220 BAR and obtain 50 to 52 full power shots while sports shooting on the range. For anyone thinking of tackling this modification, I can tell you that it doesn't involve any difficult engineering other than the ability to safely strip down the PP700 (see the Huma-Air fitting instructions here). If like me you happen to be a UK resident, make sure you mention this to the Huma folks at the point of ordering because UK power levels for air guns are often much lower than can be used elsewhere in the world and so the regulator Huma sends will need to be appropriately calibrated. After now using the PP700W on the range for bell target practice, I can vouch for the fact that the Huma regulator is a very effective improvement for the PP700. 5th Nov 2018 – Small Power Supplies using an 18650 battery As I’ve been working through the design of a stand alone processing unit with a PIC32MX170 CPU which uses a 2.4Ghz transceiver (based around the NRF24L01 chip) and a Digole 3.2” colour touch screen display. An early query was what power supply to use – given the device must be mobile. An attractive battery is a Lithium Ion 18650, given the amount of current it is capable of supplying. The downside is that directly powering logic from a single 18650 means the voltage will vary from around 4.2v when fully charged to as low as 2.5v when close to full discharge. The CPU will cope fairly well with this level of variation but the colour display becomes noticeably dimmer. I’ve used a CH340G chip in the design to permit USB communications with a PC – mainly because it presents a standard COM port signature for the PC to link to – and so makes establishing communications relatively easy. A USB plug connected to the socket will supply data and a 5v rail. The CH340G can actually use a 3.3v or a 5v supply and when using 5v rather handily outputs a low current 3.3v rail rated at around 30mA... enough to power the CPU but not quite enough to power everything else. 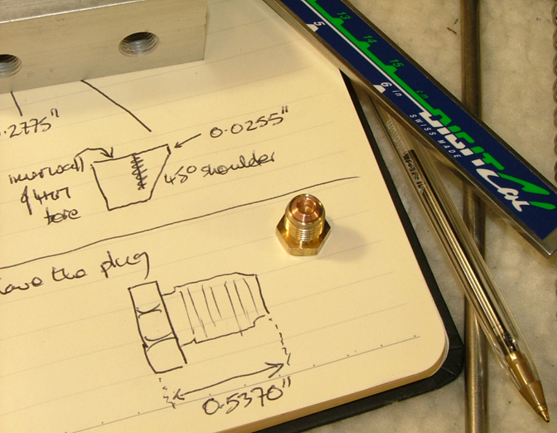 During the development of the software – a 5v USB cable was connected and the 5v rail fed to a 3.3v regulator to supply everything else, but for a stand alone prototype... a better option was required. One solution makes use of one of the rather large number of cheap step-up boards you can buy now – such as the DD06CVSA. This simple (and quite small) board has a 5v input for charging and two pins to allow the connection of a single 18650 battery. Another two pins supply the output – which is guaranteed to be 5v until the battery goes flat, at which point the board turns off. 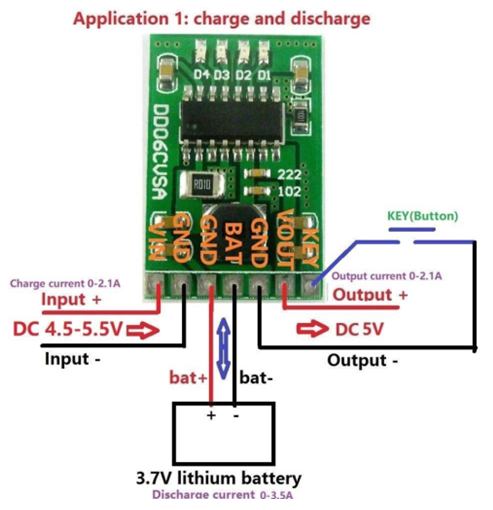 The onboard chip deals with management of the charge/discharge cycle while also protecting the 18650 battery. The PCB includes four dazzlingly bright LEDs that show the battery status (time to discharge and flashing to show charge time). Lastly the board has a "key" input which when taken low turns the board either on or off. You can see the board highlighted in red on this prototype. During tests I found the output was a little noisy with around 140mV supperimposed on the 5v output rail. That was suppressed (below 20mV) by fitting a 0.1uF decoupler and a 47uF electrolytic close to the output. In use charge and discharge works well, but the board does have some quirks when switching on or off. If for example you have a USB cable plugged in, the board will be in charging mode and will output 5v to the rest of the system. Unplugging the USB cable with a fully charged battery would (I would have thought) leave the board outputing 5v, but inexplicably the board simply turns off. 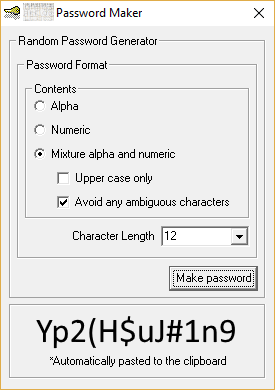 In addition the operation of the "key" input is unreliable especially if an attempt is made to turn the device on after a period of being off (overnight). Sometimes it powers up, sometimes you have to keep switching the key input to get it live. The board does automatically switch on if a load greater than around 50mA is presented and so in this case simply switching the load is the route I took to obtain reliable operation. There will be a better solution out there... one that ideally permits the CPU to fully control power cycling and at the same time query the battery condition. In this way the CPU can properly manage state while also managing the users expectation of use. But as it is, this isn’t a bad solution for a prototype - as shown below. Note the power LED's on the left side. In this configuration with a PIC32MX 170 CPU running at 40Mhz, with an SPI NRF24L01 2.4Ghz comms transceiver running polling commands to a nearby device - and with the colour display permanently backlit and working - a single fully charged 18650 battery will power the system for over 8 hours. 14th Sept 2018 – PIC32MX170 Anyone out there trying to store persistent data in non volatile memory on a PIC32MX chip and finding it a bit tricky? I'm using a PIC32MX170F256D chip and needed to store a handful of 32 bit words in non volatile memory so that a system I'm working on in my spare time could maintain state when turned off. The process isn't too bad so long as you get a couple of key concepts under your belt. On a PIC32MX170 chip, program memory is made of flash ram. You normally wipe all this memory when programming the chip... but the chip also provides a mechanism to erase/write sections of this memory using run time self programming (RTSP). This feature means that your program code can use program memory to store data that must persist after the machine has been switched off. Using flash memory does have a downside in the sense that after many write cycles the memory becomes less reliable - and so care is required to only update the memory as infrequently as possible. There are even some algorithms that deliberately use two or more pages to spread updates so that you can reduce the total number of updates to any one block. For users who only occasionally write to flash, this limitation may not present much of a problem. Anyway the problem is how is it done... given microchip documentation is not overly helpful in explaining the process. 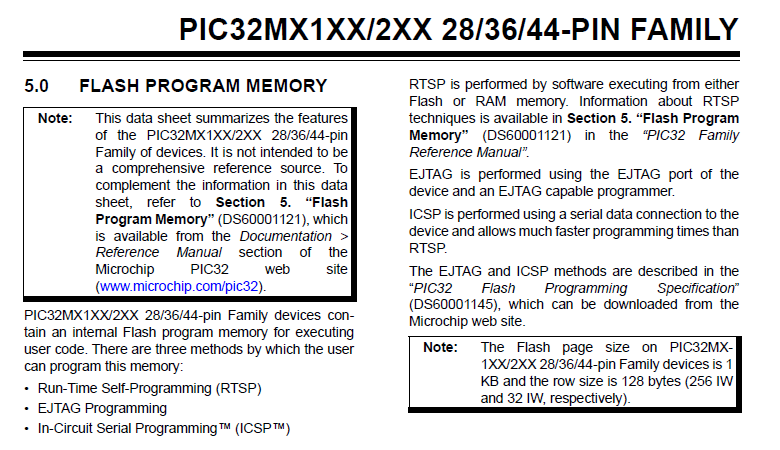 The first thing you need to figure out from the Microchip specs is the flash page size and row size. Generally you'll find these in the synopsis overview document for the chip. In the case of a PIC32MX170F256D chip - the page size is 1024 bytes (the row size is 128 bytes). What this means (and expressing this as 32 bit words instead of bytes) is that each page of flash ram is sized as 256 words and organised as 8 rows of 32 words. The page size is significant because it is the smallest size of program memory that can be erased as one complete block. If a flash ram location contains the value 0, then you'll always be able to write a 1 to that location... however if it contains a 1 you generally won't be able to write a zero without first erasing the flash ram. Given the smallest block of flash ram that you can erase is a page you can probably see the significance of knowing what the page size actually is. I'm aiming to use a single page of 1024 bytes (256 words) to hold the persistent data for this project. I'm going to place this at the top end of the program memory... and that's the second thing you need to find out - namely the address limits of program memory... which will again be confirmed in the synopsis document for your particular chip. Have a look at the memory map and in particular the virtual memory map for your chip and find the program flash section in KSEG0. For the PIC32MX170 this extends from 0x9D000000 to 0x9D03FFFF. So if we want to reserve a 1KB block at the top end of that range, the lowest address of the 1KB block would sit at 0x9D03FC00. // Function used to write a word to the NVM memory block - located at the top end of the program memory range. // Now write a test value to the first four bytes in the flash ram (index 0). Interrupts are disabled before a call to the erase page and any flash ram write operation. I'm using the 32 bit library support for the PIC32MX170 chip (PLIB) - which helpfully takes a lot of the donkey work out of figuring out the specific register access required to drive these functions, although I have to say it makes a great deal more sense if you've carefully checked the synopsis document and the flash programming supliment document before you start. Once mastered I have to say that the process works very well. 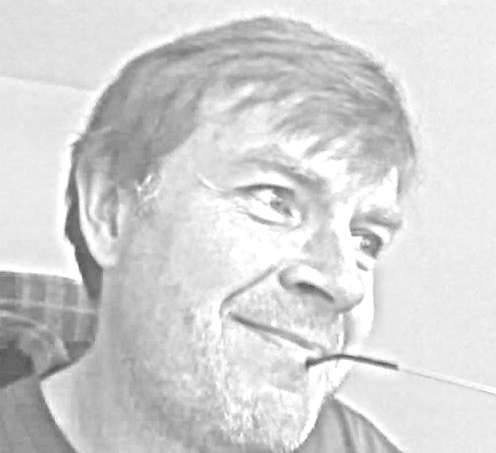 Comment 7th Sept 2018 – 2.4Ghz communications In my spare time in the evenings, I've been looking at an embedded system involving two 40Mhz CPU's. I'm using PIC32MX170F256D chips with a max clock rate of 40Mhz. Unlike some of the older 80Mhz 340 PIC32's I've worked with in the past, these newer 170 chips have more consistent and reliable silicon and also better packaging options. One of the really elegant features is a pin-for-pin multiplex system for much of the internal I/O, which permits the software to control which internal I/O signal(s) gets connected to which physical pin(s). If you don't need one of the UARTs for example, instead of tying up an I/O pin pointlessly you can reuse the physical pin for something else. As a result, these chips actually come in a 28 pin DIL package... which is really very rare. Anyway - one of the CPU's is set to measure modestly fast events and then report the relative timing(s) of the events to a 2nd CPU tasked with generating a pretty display and to calculate some basic stats such as the standard deviation, mean and the like. A problem was to figure out a suitable means of communication between the two CPU's, given one unit might be randomly moving around within a couple of yards of the other. 418Mhz transmitters and receivers were considered but two way comms is hard to make work well - and they have very little in the way of comms protocols for data checking and packet sending. IR transceivers were looked at as well, but bandwidth isn't great and their sensitivity to directionality made them very difficult to use. 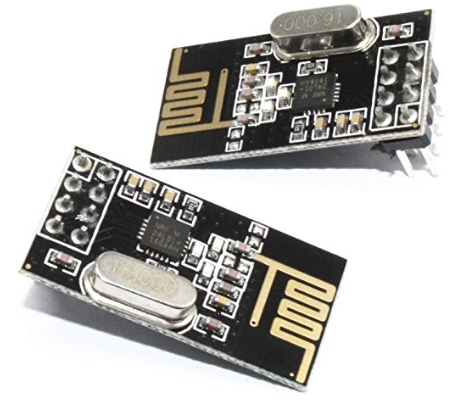 Over the last couple of years I've seen a number of 2.4Ghz transceiver boards based around the NRF24L01+ chip and usually aimed at the Raspberry or Arduino market. Although there are some restrictions at the high end of the transmission frequency range when these are used in the US, these devices otherwise have a worldwide licence making them particularly attractive for short range comms between digital systems. In early tests at data rates of 2mbs, I could establish reliable comms out to around 30 feet - and it didn't overly matter how many walls or floors lay in between. Hobby folks generally drive them with aftermarket driver scripts, offloading the problem of having to figure out the nuts and bolts of the chips operation. Thats all fine and good but you'll never really learn much about a chip if that's your approach. Initially I wrote my own C library to implement the small number of commands built into the chip (read/write register, read/write payload etc) in order to assess some very limited tasks such as sending a 4 byte buffer from one chip to another under interrupt control. I found it fairly easy to get them to work... but harder to make the comms robust and reliable so that millions of data packets could be successfully sent even while errors were occurring. After getting around a quarter of the way through my own library I stumbled on a library written by a bunch of bright young things at Cornell university - and with no licence restrictions posted. 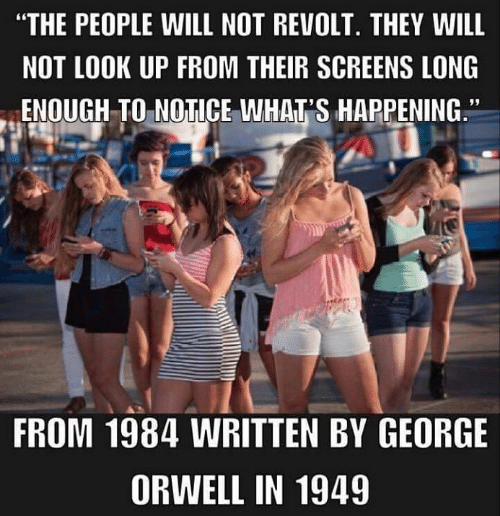 Their library is incomplete and doesn't provide support for any of the newer ACTIVATE commands (R_RX_PL_WID nor W_ACK_PAYLOAD) which interestingly open the door to all sorts of possibilities with regard to full duplex communications (they are easy commands to add if full duplex is your bag). The library was also configured to use different SPI, control bits and interrupts than I had used in my PIC32MX arrangement... but don't let that put you off - as it is trivial to recode and the library is clear enough to make that process easy. The documentation is frankly awful (considering who wrote it), with typos and a number of very confusing mistakes, but it is adaquate enough to convey the general idea. 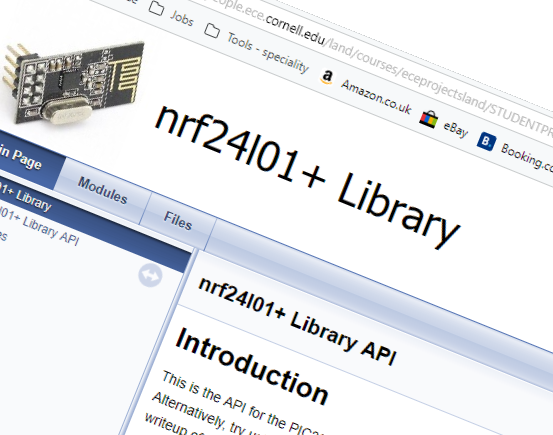 I ditched the documentation and butchered the library ending up with a pretty reliable NRF24L01 interface in C.
If you have a look on fleabay or other sellers you'll find it easy to source break out boards for the NRF24L01 from any of a gazillion different manufacturers (most are Chinese). These generally low cost boards extend the I/O required to drive the chip (usually to an 8 pin berg strip) and provide a basic 2.4Ghz antenna with a decent ground plane. As with all aftermarket kit, the quality can be a little variable - and these boards often do far better if a good sized tantalum capacitor (around 100uF) along with a 0.1uF decoupler are used across the rails. The NRF24L01 supply is 3.3volt, but the inputs are actually 5v tolerant. The chip is controlled using an SPI bus consisting of six signals. For any engineers unfamiliar, don't worry, the heart of an SPI system only requires three signals given it is simply a shift register arrangement, extending to the outside world (a) the output from the last stage of the register, (b) the input to the first stage and (c) the clock. As the clock runs, whatever had been written in parallel to the shift register, will be serially output on the output pin, while whatever data is presented on the input pin will be shifted into the register at the same time. So n clock pulses later, the output will have sent n bits while n bits (presented on the input) will be sitting ready to read from the shift register. PIC32MX chips usually build in 1 to 4 SPI interfaces and allow variable width SPI (8, 16 or 32 bit) - but for the NRF24L01 32 bit SPI transfers are required. Three other strobes are required... two are outputs from the controlling CPU (inputs to the NRF24L01) and one is an output from the NRF24L01. The first of these is an active low chip select signal (called CSN) which is asserted by the controlling CPU whenever the SPI is being used to read or write data to/from the NRF24L01. The 2nd signal called CE (chip enable) is active high and is used to switch on the transmission / reception sections of the chip. The third and last signal is an output from the NRF24L01 and is used to raise interrupts in the controlling CPU. This signal asserts after data has been transmitted, received or when the maximum number of retries have been exceeded... yep, you read that right. This little chip has a protocol built in that demands an acknowledgement packet after a transmission and it will retry up to 15 times, with a configurable delay between retries if that ACK isn't received.. If a data application requires data accuracy (some don’t) then three strategies help cope with this problem. Take advantage of the enhanced ShockBurstTM feature built into a NRF24L01 chip. ShockBurstTM is a protocol that forces the NRF24L01 chip to wait for an acknowledgement from the far end and not to proceed until after that ACK has been received. The chip will retry a fixed number of times but if it ultimately fails to get that all important ACK, it will report the fact to the caller, which can then deal with the problem. On the controlling CPU, you must not code any function so that it can lock. For example it must not be possible for an imaginary function, lets call it “GetMyData()” to sit forever polling some kind of flag somewhere that confirms if data has been received. The problem with this is that if the flag never asserts, then the GetMyData() function will loop forever. Instead, you need to frame that flag testing operation within an outer loop that monitors how long the process actually takes and forcibly aborts the process if it takes too long. Another issue to consider is timing. 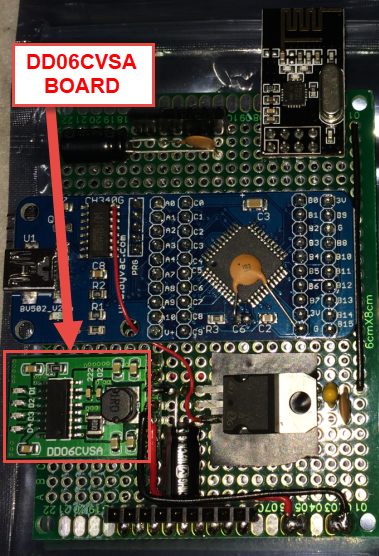 The NRF24L01 chips will retry until ACK's are received - so effectively there are two distinct processes going on. 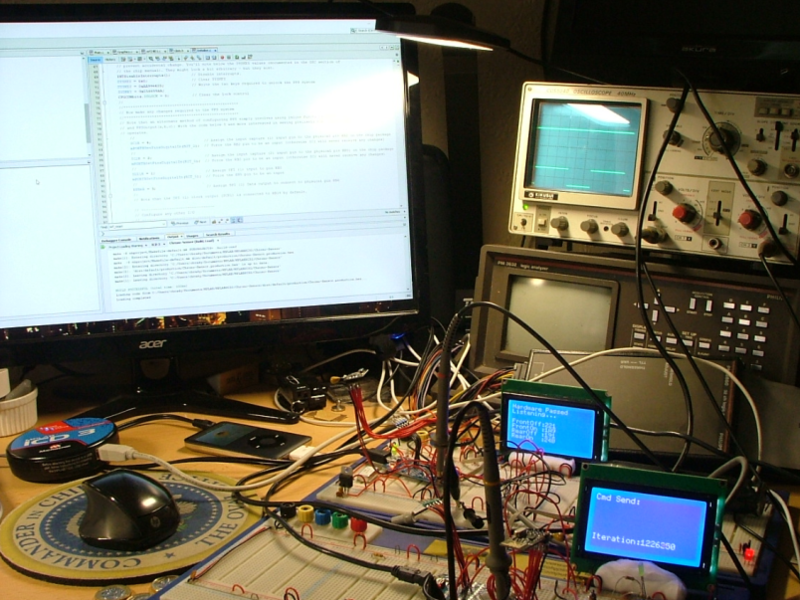 The CPU tells the NRF24L01 to do something and then the chip will take time to complete the task. If the process fails due to the need to retry, more time will be required. Imagine you've built a system with two of these devices and where a command can be sent from A to B such that B will respond with some sort of data. Lets say A sends command N which for some reason fails. At that point if A gives up on sending command N and sends command N+1 there is a possibility that the response it will receive will actually be the older response intended for command N - given that the NRF24L01 will have been busily retrying in the background and off course, might succeed. It's a fairly standard overrun problem but it does need some thought during development. In tests on my development systems here I found this fault would occur quite randomly and usually after millions of packets had been successfully exchanged... and it was simply down to the relative timing of the sending of test packets. The collet (arrowed in red) is a relatively lose fit in the end of the main body. 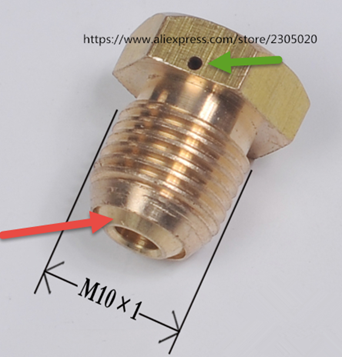 In normal use the body of this bolt threads horizontally into the manifold. Can you see what the problem was? Unless the collet is somehow locked into place, then as the body is screwed home there is a risk that the collet will rattle free and drop unseen into the bore of the manifold. At that point if you tighten the head, as I did, you'll crush the collet. I removed the threaded burst disk protector and realised that not only had I crushed the collet but I’d also damaged the countersunk body of the manifold. So at that point I removed the manifold from the pump completely so I could get proper access to it. A 5mm HSS drill bit in a pillar drill was used to clean the bore of the manifold... removing the bare minimum required to clean the base of the bore. The crushed collet was ruined, completely misshapen, there would be no compressing it back into shape. 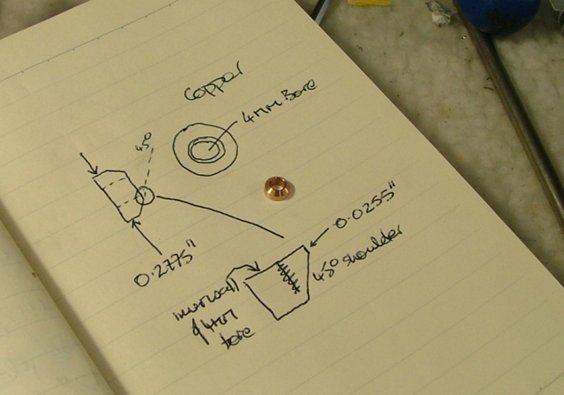 I didn’t have any suitable brass stock to machine my way out the problem, but I did have some 10mm copper bar – and so started the process of turning a replacement collet. The newly machined copper collet is 0.2775” in diameter, centre drilled with a 4mm bit and with a front side shoulder cut to 45 degrees leaving a flat of just 0.0255” to meet with the drilled shoulder in the aluminium manifold. The overall height isn’t shown on the paper - but in the end I found 0.12” worked well. I generally tend to use inches rather than metric - simply because I'm more used to working in thousands of an inch of precision. On inspecting the main body – I realised that the base of the threaded end of the body was a little rough – and so turned that to cut off the bare minimum required to clean it up. That resulted in a body length (without collet) of 0.5370”.